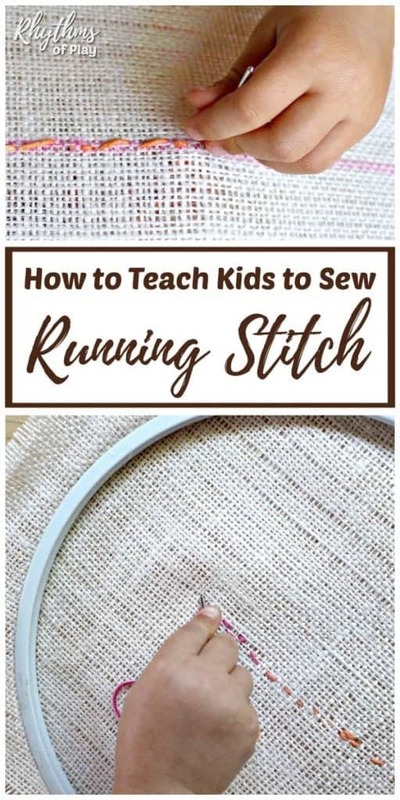 Teach kids how to sew running stitch by hand using burlap and yarn for an easy beginning sewing lesson for children. Learning how to sew a line using a basic running stitch develops the fine motor muscles of the hand to prepare the hand for writing and more detailed handwork projects. This was the first time my daughter sewed a line. I was shocked at how well she did and how much she liked it! Starting her homeschool sewing lessons with this simple burlap and yarn lesson seems to have worked well for her so far! 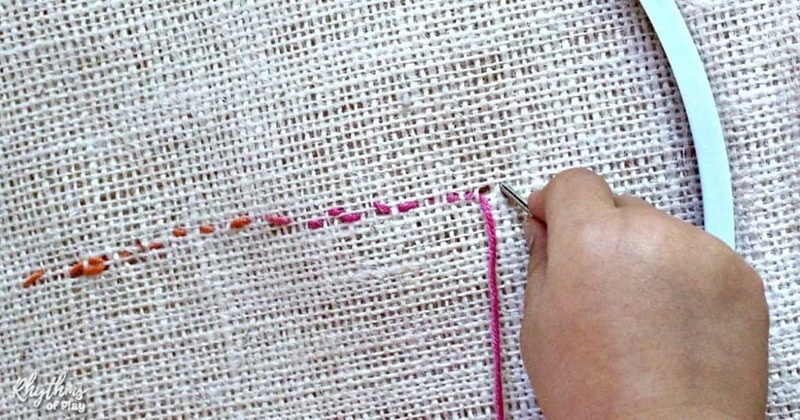 Follow the simple steps below to teach your children how to sew a running stitch by hand. If your child has never tried sewing before, you might want to start with this burlap and yarn beginning lesson in sewing for young children. Another easy beginning sewing project for kids is to turn sturdy fall leaves into lacing cards. Click on the blue hyperlinked text to learn how to do this simple sewing activity. Kids learn best by watching and imitating the actions of others, and sewing a running stitch is no exception. Before you hand the needle and thread over to your child, it is best if you show them how to sew a running stitch by sewing a line yourself. Two embroidery hoops will make this easier but it is not mandatory. It’s just as easy to have another piece of burlap standing by to change out when you are finished demonstrating how to sew a running stitch by hand. Cut out a square of burlap slightly larger than the embroidery hoop . Show your child how to thread the needle by placing the yarn through the big eye. It helps to moisten the yarn first. Show them how to use a needle threader if you prefer. Like sewing, learning to thread a needle is an excellent fine motor activity. Use a pen to draw a line from one side of the embroidery hoop to the other. I let my daughter select the color we used and of course, she choose pink… again. This choice was not the greatest because it made it hard to see her hand sewn running stitch–but it still worked. Today we use disappearing ink for all sewing projects. *Update: Another option we recommend is to use disappearing ink to make the line. It can be washed off or it will disappear on its own within 24 hours. Using disappearing ink makes sewing embroidery stitch by hand a lot easier for children. Use it to help your children complete any sewing project! 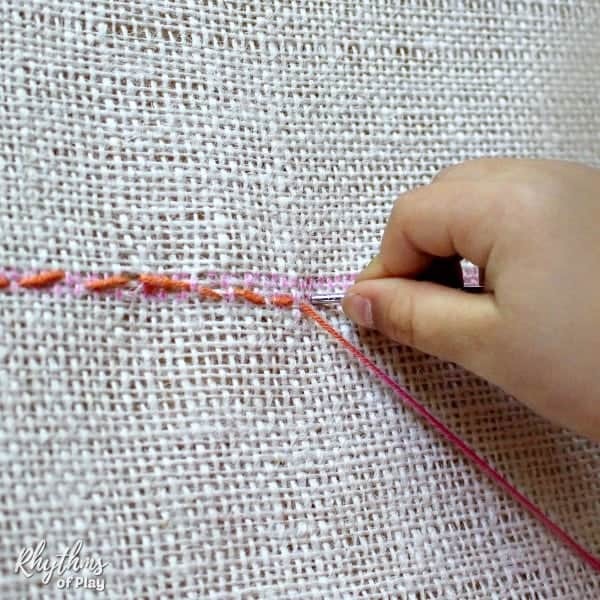 Once you and your child have prepared the embroidery hoop and sewing needle following the directions above, it’s time to learn how to sew a basic running stitch. The step by step photo tutorial for both preparing the sewing lesson and learning how to sew is pictured above. Insert the needle through the back of the burlap that is in the embroidery hoop. Pull the darning needle and yarn through until the knot catches. Insert the sewing needle near where it came out along the same marked line. Insert the darning needle into the back of the burlap along the same line near where the needle came out. Pull it through to the front. It will be more of a challenge for kids to continue to sew a running stitch on this side because the line is not marked. 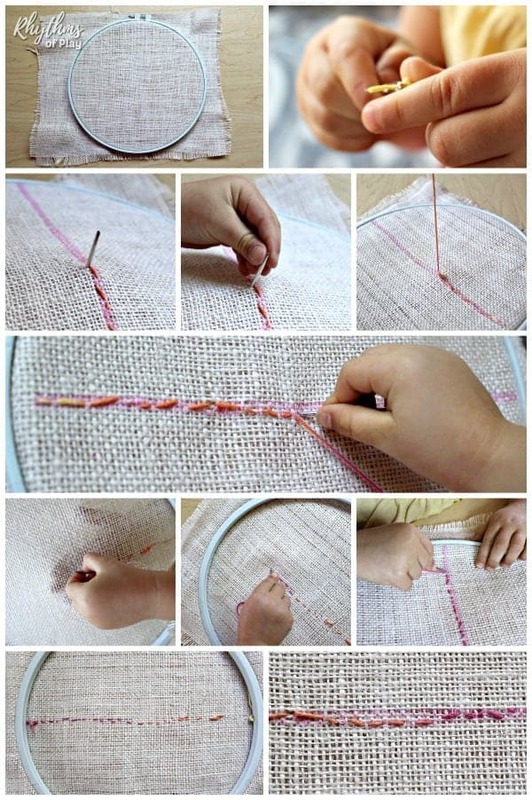 This will help children learn how to sew running stitch in a line once it is no longer marked. Repeat until the line of running stitches has reached the other side of the embroidery hoop. Tie it off in the back and draw another line to start again if your child would like to continue this sewing lesson for children. Learning to sew is an important home life skill. Teach kids to sew a line by hand for a simple beginning lesson in embroidery for kids. 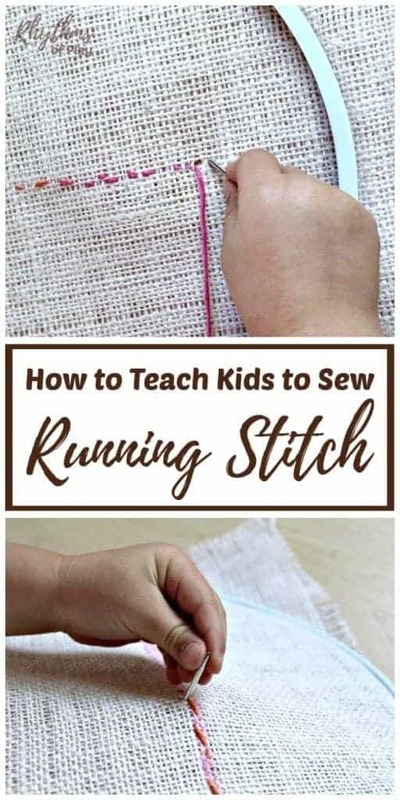 Invite your child to sew a running stitch without a marked line to guide them after they have practiced leaf lacing and/or sewing with burlap and yarn. Learning the running stitch is an easy homeschool learning project for the development of the fine motor muscles in the hand. Don’t forget to pop over to have a look at some of our other begging sewing projects for kids listed below. We have a few more fun and easy sewing projects planned, so be sure to sign up for our newsletter so you don’t miss anything!